It’s easy to focus too much on work. The spa is the perfect antidote to the over scheduled lifestyle. If you are consistently thinking you need a vacation, perhaps you need to create a paradise at home. Of course building your life so you don’t need vacations could mean a variety of things to different people. One way to accomplish this though is certainly making your home a sanctuary, an escape from the world, and a place you truly love. An evening in a relaxing spa can provide you with peace of mind. Owning a Spa gives you consistent opportunity to invite family, friends and neighbors for a fun way to talk in a relaxing spa. Skip your vacation this year and invest in a long-term fix to your everyday hustle and bustle. Consider trading the stress of a vacation for the daily relaxation of a spa, here are three reasons to skip your vacation and three reasons to get a spa. Sure you can manage when you’re travelling alone. A delay gives you some time to catch up on that book or podcast calling your name. But now imagine a 4 hour delay in the company of the kids… When it comes to that, we have three words: No. Thank. You. Wouldn’t you rather be at home relaxing in your American Spa? Expensive resort food. Expensive theme park food. Yep we’re talking $4 for a bottle of water. And where did this chicken come from that they are charging so much for six nuggets?? Maybe an ice-cold beer could help ease the stress… for a nice $15 more. Wouldn’t you rather be cost effective at home in your American Spa? When you’re packing, repacking, unpacking, and exploring a new place surrounded by strangers, some paranoia sets in that you’ll lose all your important documents and that you’ll return home missing something valuable. I’m sure you can see where I’m going with this. Stay home and enjoy your spa instead! All your valuables will be stored safely away in your home while you relax worry-free in your soothing, inviting American Spa Hot tub. American Spas are affordable. 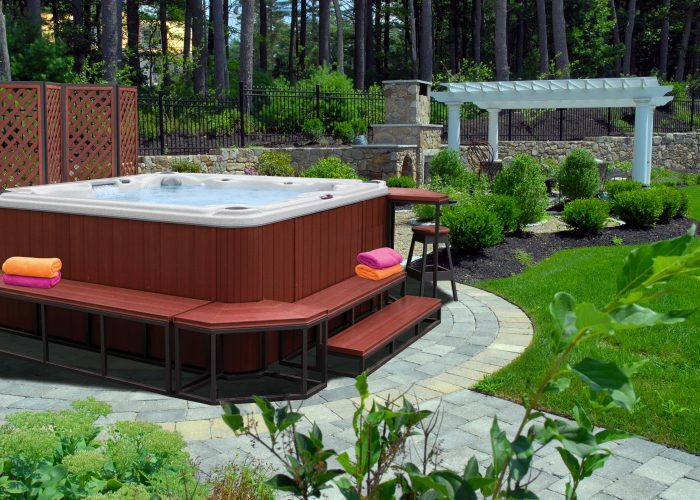 Portable hot tubs are more affordable than ever before, due to efficient manufacturing practices and competing brands. We’ve managed to merge higher-end features into our spas while lowering the price points. Creating an attainable everyday mini vacation. Our portable Spas are adapted to consumer’s lifestyles. Our spas come in all different shapes and sizes, from two-person hot tubs to 6-person models. Our spas can be installed indoors or outdoors. Newer technology has allowed the spa owner to keep water clean and clear with a couple of minutes of weekly maintenance. Keeping this stay at home vacation carefree. Spas provide “vacations/therapy” 365 days of the year. A spa can provide the ideal venue to connect with family and friends. And they provide a multitude of health benefits ranging from stress reduction to muscle recovery. For long-term, consistent relationship fuel that leads to happiness, American Spas wins, hands down. Skip the family vacation this year and join our American Spa Family for a year round relaxation opportunity. Great relationships need a consistent investment of energy and time. Daily or at least weekly opportunity for relaxation, meditation, connection and socialization with family, friends and neighbors will take you away from that everyday grind. This year invest yourself in an American Spa grow your awareness, relax and enjoy your family stress free. For buying options view our online showroom and subscribe to our website for a head start on upcoming deals, or simply contact us. We are more than happy to help you find the Spa of your dreams.